Scarves are the perfect knitwear: they are often easy to make, are great portable projects, have endless design possibilities, and are great gifts. However, I find one of the biggest frustrations with scarves is that even when you block them aggressively, they often end up rolling with use. The rolling culprit is most often stockinette stitch. Despite it's lovely, classic, elegant appearance, it likes to curl in on itself. Thus, I've brought together some great patterns that use stockinette sparingly, or not at all! However, keep in mind that yarn choice will often have an impact, too. Even the most resistant patterns could try to defy your flattening efforts. Animal fibers are especially prone to curling while acrylics and cottons are more likely to cooperate with you. However, take this with a grain of salt - sometimes the right pattern can tame stubborn yarn, and sometimes great yarn can curl under the pressure of certain patterns. Experiment! One my absolute favorite curl-resistant patterns is SmarieK's Asherton Reversible Scarf, which looks complicated, but is just basic knit and purl. You can check out my Asherton Scarf in silver, one of my earlier projects. I have made several of Tienne's Old Shale Scarfs. Check out my Old Shale Scarf that didn't roll, 100% because of the yarn. While ribs are notorious for curling and scrunching, Suzie Blackman's Staggered Rib Scarf is roll resistant and shows off the striping rib pattern. I made a super soft alpaca scarf for my dad with a diagonal rib. Similar to the strategy behind the Asherton scarf, there are many great alternating knit and purl patterns, including Phazelia's Checkerboard Scarf or Michele Wang's Seedy Scarf. Chunky yarns or patterns that take on a more "chunky" appearance, like the Matilda - A Winter Cable Scarf by Arianna Halshaw, are also great anti-curlers. Missing those cables? Cables are often set on a reversed stockinette background to really pop, thus leading to scarf compression. 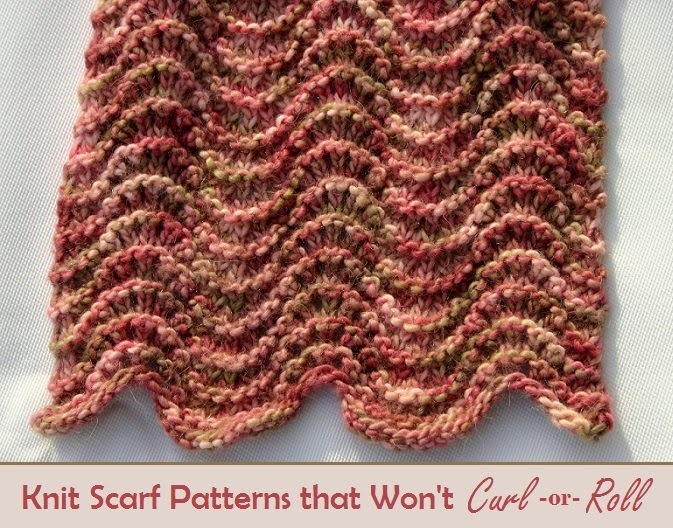 Jenny Wilder has a great solution for this, design her scarf pattern with cables on a knit/purl seed stitch: "While Watching British Mysteries on Netflix." If you want to leave the problematic stockinette stitch behind all together, try Heather Wells' basic Garter Stitch Scarf with beautiful pastels, Kirsten Kapur's Kersti Stripe Scarf, or Windy's Lonely Doll Scarf. Or, try a "funkier" garter stitch variation with Lisa Kartus' Dyed by the Stitch Scarf, Adrienne Lashley's Simple Panel Scarf, or Missy Angus' Super Loops Scarf. These are just a few of the many patterns available that will help your scarves resist the urge to curl and roll. Again, yarn matters, but a roll resistant pattern puts you one step closer to a well-behaved scarf! Enjoy your next knitting adventure! I love this pattern! I would love to try it out but I am having a difficult time getting into her blog! any suggestions? thank you so much for posting this. Hi, Adrienne! Glad you like the post. Which pattern are you trying to see? Is there a pattern for the wave scarf in the picture?